Struan House offers a warm welcome, exceptionally well appointed double bedrooms and breakfast from the cosy comfort of our dining room, with picture windows overlooking the fishing quay at Tarbert Harbour. Enjoy watching the boats coming and going, the fishermen landing their catch, the cruising yachts moored up beyond and the backdrop of the green and heather covered hills surrounding this special harbour village - as you enjoy our wonderful breakfasts, cooked to order. Kristen and John Scott, look forward to welcoming you to Struan House, Tarbert Loch Fyne - a fine place to stay. Struan House was originally built in 1846 as a small hotel. 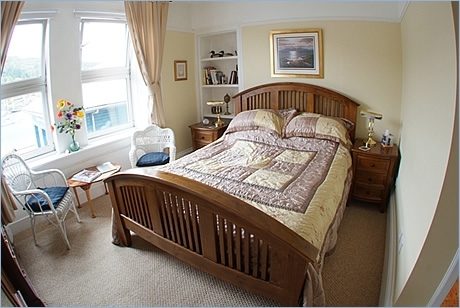 It still retains all the charm and character you would hope to find in a harbour side dwelling, and has been brought up to a high, comfortable standard. 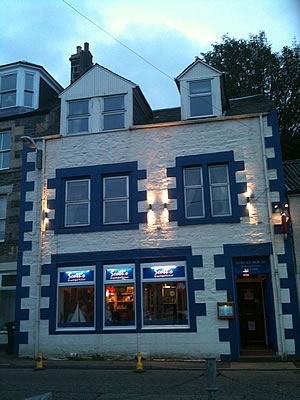 Struan has a very relaxing feel and is extremely well placed in the village on the quay within a few minutes stroll of Tarbert's ale houses and range of excellent restaurants and bistros offering a wide variety of locally caught Loch Fyne seafood and catering for a wide range of tastes and budgets. Struan is also in marvellous position for all the daily ferries: to Arran, Gigha, Colonsey, Jura and of course the "Whisky Island" of Islay with its 7 distilleries. A two hour ferry crossing among breathtaking scenery with plenty of time on return to clear the mind in the pure Scottish sea air! A wonderful day out with a friendly return to Struan and a relaxing evening. For those whose sea legs are not so firm, the magical drive mostly alongside the sea exploring the Kintyre peninsular, taking in the "Mull Of Kintyre" with its view of Northern Ireland only 12 miles across the Irish sea will surely be a memorable experience. Tarbert has a range of very special festivals throughout the summer including 'The Scottish Series' second only in the yachting calendar to Cowes I.O.W. The Seafood Festival celebrates the famous Loch Fyne harvest and now incorporating the 'Traditional Boat Rally' with a growing number of wonderfully restored Scottish boats of yesteryear. Tarbert Fair (for the young at heart!) and of course the wonderful Music Festival in September, but you may have to book very early as the village is bursting at the seams on these occasions. A warm welcome awaits you with comfortable bedrooms and a choice of breakfasts to set you up for your days adventure. So why not give yourself some time to relax, in this magical harbour retreat and enjoy the atmosphere and hospitality of STRUAN HOUSE.